At last update I was preparing for the start of SISAP 2016, likely my last conference as a working academic. I gave my talk there and did other conference things, had one day of free time in Tokyo, and then spent a day travelling to Sapporo. Now it's early morning and I'm gearing up for the main "vacation" part of my trip. Remember that you can usually find photos and more up-to-date commentary in my Twitter stream. I'm not going to go into much detail on the conference's scientific content, not least because it's a business I am getting out of. The schedule was a bit gruelling - they had talks and activities scheduled into late afternoon and then social events into the night on two of the three days. I think it was pushing the limit for amount of material to fit in a three-day event, and in future they'll either have to become a bit more selective or go to a fourth day. The catered lunches and coffee breaks weren't great, but the conference banquet on the second day was excellent. Seven courses of fancy Japanese food, very nice venue ("Happo-en"), and so on. See my Twitter postings of photos of the food, the Engrish and Japanese versions of the menu, and so on. I think my favourite course was the "tailoring soup." It seemed a little peculiar that they chose to pair all this high-end food with Asahi Super Dry, which is an accurate imitation of Budweiser; but my German colleague suggested that "maybe they really think it's good," and I think that's probably the explanation. Once I figured out that the staff would just keep refilling whichever glass I drank from, I stuck to the nihonshuu ("sake" for English speakers), which was genuinely good. The conference ended at about 4pm on its third day. I was planning to meet a friend for dinner in front of the Starbucks in the shopping mall overlooking the scramble crossing at Shibuya station. After I waited a half hour past the apponted time without seeing her, we managed to exchange Facebook messages and establish that there is more than one Starbucks meeting that description, because of course there is. We went for udon, and I had the experience I had twice before with this same friend on my first trip to Japan, of not being able to finish my meal. Eyes bigger than stomach. I think it may have to do with her preference for dining late, which means I spend a lot of time out in the hot Tokyo night getting dehydrated while trying to meet, and the dehydration kills my appetite. The next day was free time in Tokyo. I bought a JR East/South Hokkaido rail pass, which covers six days for 27000 yen; the round trip by shinkansen and limited express trains from Tokyo to Sapporo works out to 28200 with regular tickets, so the pass just barely pays for itself even without any other usage. I went back to the Shibuya/Harajuku area (my hotel was in Kanda, about 15 minutes' subway ride away) and looked for the FiveG synthesizer shop. It took me a while hiking around the commercial Hell that is Harajuku before I located the right building, and when I got there, they were closed until noon. So I went off to the Meiji shrine for a while, had lunch at a Hawaiian-style burger restaurant, and came back. The burger place advertised a "Halloween Burger" with an orange bun covered in purple power, and purple mashed potatoes on it. I decided that was too scary for me, and just went with a regular burger. 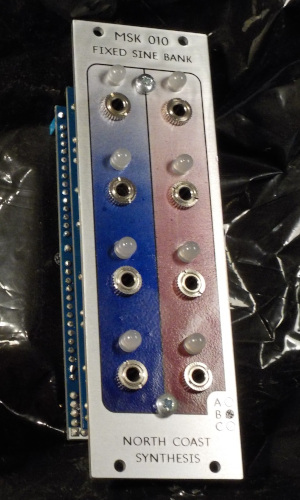 FiveG didn't have either of my two highest-priority items (Hikari Sine Eurorack oscillators, and a Roland V-Synth XT), but they had a lot of other neat stuff; see photos. Many of the girls in Harajuku, and some of the boys, are wearing toques this season, more or less Canadian-style, even though it's still a little warm for that in Tokyo. I put on mine once I arrived in Hokkaido where it's a fair bit colder, and I seem to be the only one wearing a toque here. After FiveG, I walked a little further South to the Shibuya area and looked for Echigoya, which is supposed to be on the ninth floor of the most nondescript building across from Tower Records. It took me longer than it should have to find Tower Records, but after that it wasn't hard to find the shop. It's a tiny place, very cramped and less stock than FiveG, but they did have a couple of Hikari Sine oscillators (floor demo instances only) so I bought one. I then spent some time browsing in the nearby Tokyu Hands (basically a hardware store) before looking for another friend at a meeting spot described as "near the well-known doge at Shibuya Station" - where, of course, we found each other in about five seconds at the appointed time. Prior to that, I also found Waldo. We went to a bar where they serve better-quality Japanese beers, and I drank too much and got up the next morning with a hangover severe enough to make the subsequent all-day train trip to Sapporo a bit challenging. I bought a boxed lunch at Tokyo Station despite having no appetite whatsoever at that moment. The Shinkansen Hayabusa 13 from Tokyo to Shin-Hakodate-Hokuto (4 hours 17 minutes, 862km) went smoothly and on schedule, except that in the last segment they kept making announcements on the PA in Japanese that I could understand well enough to know were something about the "Super Hokuto 15 Limited Express" - the next train I wanted to take - but I couldn't really understand what they were saying. Also many announcements about the Super Hokuto 10, which is a problem because these two trains are pronounced "suupaa hokuto jyuu gou" and "suupaa hokuto jyuu go gou," and it was not so easy to recognize the presence or abscence of that extra syllable what with everything else going on. I arrived in Shin-Hakodate-Hokuto, which is in the middle of nowhere, and nobody there could speak English at all and there were a lot of employees hanging around shouting through megaphones stuff about various Super Hokuto trains; it sounded like all traffic on that line that afternoon had been screwed up. I tried to talk to a ticket agent, who seemed terrified by my attempt to use English, and she was trying to call for help and receiving no response on a walkie-talkie to get someone to come speak English to me until I gave in and switched to my somewhat rusty Japanese ("densha wa diiree DAKE desu ka? kanseru ja nai?" - is the train ONLY delayed? not cancelled?). She was much relieved, and gave me what I understood as assurance that my train was not cancelled, only delayed about an hour. Interesting that an hour delay was enough to cause the level of panic that seemed to be in progress; I think of other places where they might not even bother making an announcement about it. I narrowly avoided getting on the Super Hokuto 10 when it showed up shortly after the originally scheduled time for train 15, and that would have been a problem because it goes in the opposite direction. When my own train did show up there was further confusion because (I think) they were changing all the car numbers around - there was a lengthy announcement that seemed to be saying "If your ticket is for car X, then please go to car Y instead" for each car in the train. Fortunately, mine happened to be for X=Y=5; that is, I was in one of the cars not changed around. It didn't help that the staff were also spending a lot of time simply directing people to where each car was physically - they were clearly marked with signs, but many passengers seemed to need the personal touch. So the Super Hokuto 15 showed up 65 minutes late, I got on, it departed, and the train promptly stopped dead on the tracks for about ten minutes, apparently to let another train pass. I think with it already so far off schedule and the tracks already booked for other purposes, they were reducing my train's priority in order to avoid having to take other trains off schedule too. So even though this was a Limited Express, in principle quite a fast train, it took a long time to cover the 300km to Sapporo. Pretty much nobody speaks English in Sapporo. Some, but not all, of the printed material in the hotel comes with translations. We're a long way away from relatively cosmopolitan Tokyo. Now here I am with three full days of relaxation time. After posting this, I'm off to sample the hotel breakfast, and then probably to visit some nearby Shinto shrines.